How do we come to be who we are? Why do we differ in our personalities? How do these differences matter in life? Individual Differences and Personality aims to describe how and why personality varies among people. 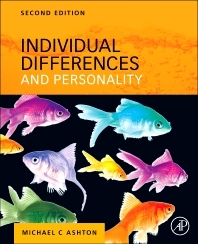 Unlike books that focus on individual theorists, this book focuses on current research and theory on the nature of personality and related individual differences. The book begins by discussing how personality is measured, the concept of a personality trait, and the basic dimensions of personality. This leads to a discussion of the origins of personality, with descriptions of its developmental course, its biological causes, its genetic and environmental influences, and its evolutionary function. The concept of a personality disorder is then described, followed by a discussion of the influence of personality on life outcomes in relationships, work, and health. Finally, the book examines the important differences between individuals in the realms of mental abilities, of beliefs and attitudes, and of behavior. Includes various boxes containing interesting asides that help to maintain the student’s attention. Undergraduate and graduate level courses in personality. 2.3 Do Personality Traits Exist? 3.3 Factor Analysis of Personality Traits: How to Find a Representative Set of Traits? 9.1 Does Personality Predict Features of One’s Life Story? 10.2 The Structure of Mental Ability: One Dimension or Many? Michael C. Ashton is a professor of psychology at Brock University in St. Catharines, Ontario. He received his Ph.D. from the University of Western Ontario in 1998. As a grad student in the late 1990s, together with Kibeom Lee, he did some cross-cultural research to find out whether the “Big Five” personality dimensions found in North America could be recovered in other cultures. Using their own work and that of other researchers, they found that there were actually six personality dimensions. The “new” one was the H factor, or the Honesty-Humility Factor, was discovered and is now considered one of the six dimensions of human personality. In addition to the second edition of the textbook, Individual Differences and Personality, he is the author of numerous articles in scientific journals, and co-authored with Kibeom Lee The H Factor of Personality.